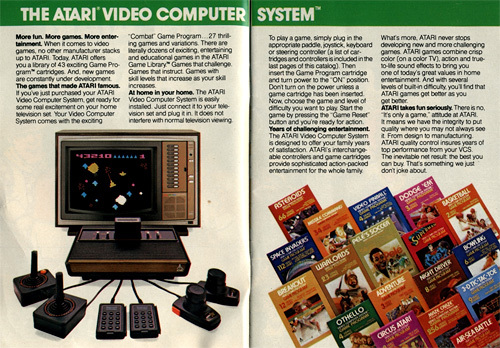 Mid-Week Time Waster – 1981 Atari Catalog Scans | OhGizmo! By Andrew Liszewski on 04/09/08 • Leave a comment! I have fond memories of my childhood (minus the noodle incident) and for a gamer, nothing says the early 80’s like Atari. So if you’ve got a few minutes to spare and fancy a trip down memory lane, check out these scans of a 1981 Atari Catalog on HuguesJohnson.com. The catalog was actually found by a friend of his while moving, and Mr. Johnson was kind enough to put it online for the rest of us to enjoy. While a lot of the games in the catalog have become classics, the fun part is looking through the lavish illustrations that barely resemble what the actual gameplay was like. And if Atari was never your thing, you might want to check out the ‘Scans’ under the ‘Video Game Features’ section of HuguesJohnson.com where you’ll find copies of old Sears, Intellivision and even Coleco catalogs and flyers.